Adorable he may be but Timmy is a little lamb with a lot to learn. He has just turned 3 (in sheep years) and being the only lamb in the flock, Timmy has been used to getting his own way. Now for the first time, Timmy is going to have to learn to get along with other little animals. Eight Timmy-tastic Episodes: Snapshot Timmy, Timmy’s Hiccup Cure, Timmy Can’t Dance, Timmy Plays Ball, Timmy’s Picnic, Timmy Tries to Hide, Timmy on Wheels, ..
Own Timmy Time Series 1 to 5 Complete Collection DVD from Deff, DVD, Blu-Ray & 4K Video Specialists - Free UK Delivery.. It's dressing up time, and Timmy gets to play Doctor - but he won't take his costume off and insists on treating his class-mates as patients. But when a mysterious case of spots breaks out during Art Time, his friends turn to Doctor Timmy to find the cure. Join in the fun with 8 Timmy-tastic episodes! Doctor Timmy Timmy's Cookie Timmy's Big Search Baby Time Timmy Timmy Finds Aliens Ballerina Timmy Boing Boing Timmy Timmy In Tune Speci.. The class are making a Chinese dragon and guess who wants to be the head…? Timmy of course. But it’s Finlay that gets the honour much to Timmy’s disappointment. Until that is Timmy realises that there’s another part of the dragon which is as special and essential and just as much fun – the tail! Episode: Timmy and the Dragon Fix It Timmy Timmy Shapes Up Timmy’s Bouncy Friend Timmy’s Castle Timmy’s Twin Special Features 20 Minute Speci.. Eight more episodes of the 'Shaun the Sheep' spin-off following the adventures of Timmy the Lamb. Timmy has just turned 3 (in sheep years) and - being the only lamb in the flock - he has been used to getting his own way. Now, for the first time, Timmy is going to have to learn to get along with other little animals: Ruffy the dog, Stripey the badger, Paxton the pig, Finlay the fox, Yabba the duck, Otus the owl, Mittens the cat, Apricot ..
Own Timmy Time - Timmys Birthday DVD from Deff, DVD, Blu-Ray & 4K Video Specialists - Free UK Delivery..
Adorable he may be but Timmy is a little lamb with a lot to learn. He has just turned 3 (in sheep years) and being the only lamb in the flock, Timmy has been used to getting his own way. Now for the first time, Timmy is going to have to learn to get along with other little animals. Includes 8 New Timmy-Tastic Episodes: Timmy's Plane Timmy Learns Magic Timmy's Tractor Timmy the Postman Timmy Gets Spooked Timmy's Tins Timmy Rings the B.. 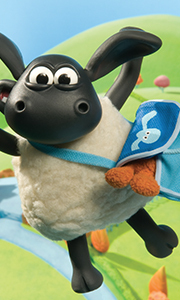 Seven episodes from the 'Shaun the Sheep' animated spin-off following the adventures of Timmy the Lamb. In this instalment, Timmy and his friends from the nursery go to the seaside for their first trip. When his teddy bear and Bumpy the caterpillar find themselves stranded at sea Timmy comes to their aid. The episodes are: 'Timmy's Seaside Rescue', 'Timmy and the Kite', 'Timmy Makes It Shine', 'Timmy On Safari', 'Timmy the Hero', 'Timmy.. Eight more episodes of the preschool stop-motion animation series from Aardman Animation. Each episode follows the trials and tribulations of Timmy the Lamb and his various furry, feathered and spiky little friends as they go about their day at nursery school. Episodes are: 'Timmy's Snowman', 'Timmy's Monster', 'Timmy Slips Up', 'Timmy's Snowball', 'Fireman Timmy', 'Timmy and the Balloon', 'Squeaky Timmy' and 'Timmy and the Super Rabbit..